Falling neatly between the J/70 and J/111, the 88 might be labeled midsize if it were an automobile, but no matter what you call it, the J/Boat design and build team found the sweet spot with this 29-foot family daysailer and racer. It's a J, so it's fast and fun to sail in a variety of conditions. Its success is well documented in an auspicious debut in 2014, including second in class in the Chicago-Mackinac race. While it is small enough to be single-point lifted for easy storage and trailering, it is big enough to have an interior that's surprisingly comfortable, with enough elbowroom to extend sailing through the weekend. The Harken traveler is located on the cockpit sole and is located within easy reach of the helmsman. 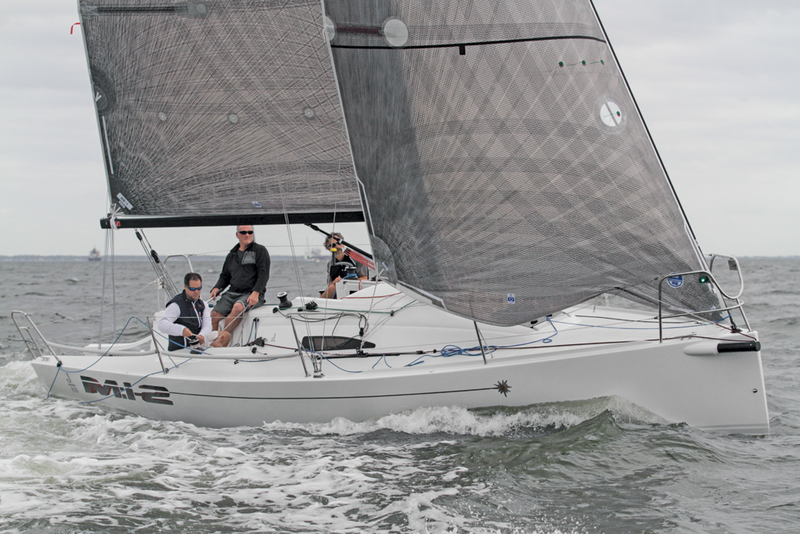 We tested the J/88 after the United States Sailboat Show in Annapolis, Maryland, and the blustery conditions were perfect for pushing the boat hard. By the time we corralled David Malkin of North Point Yacht Sails, the sky was overcast and the winds were steady at 20 knots. David, who has campaigned a J/70 for a few years, didn't need much persuading to take us out on his brand-new J/88, hull No. 57. 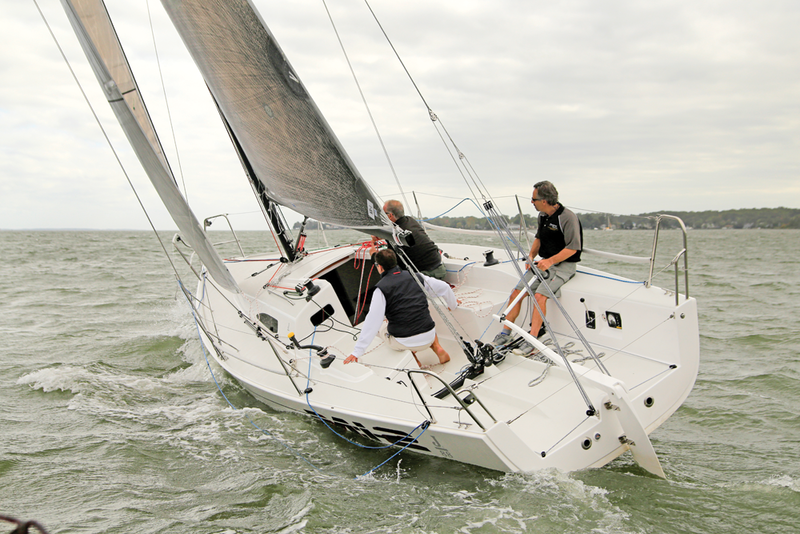 A big part of the J/88's allure is the simplicity of the systems designed into the boat. 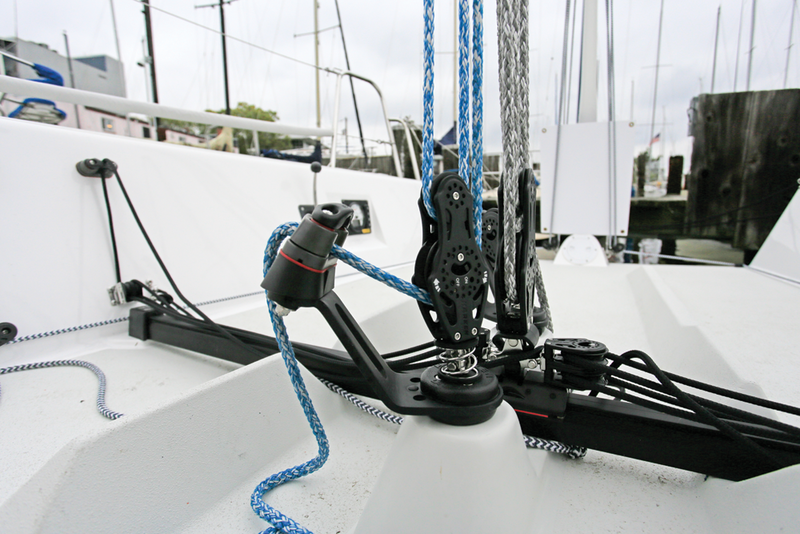 The high-aspect, double-spreader carbon rig, which is deck-stepped for easy stepping and tuning, features a nonoverlapping sailplan. No genoas are needed, and the retractable sprit, a J trademark, makes for easy spinnaker launching. Within minutes of leaving the slip, the 14-horsepower inboard Yanmar was silenced and we were tacking out of Back Creek. Once on the Chesapeake Bay, we cracked off on a tight reach and zoomed toward the far shore. This promised to be an exciting boat test. All controls are lead aft to the cockpit, making shorthanded sailing easy. The cockpit is the heart of the J/88. The T-shaped, open-transom layout provided plenty of room for our crew of three to handle the boat with ease. All sail controls are led aft to clutches and winches on either side of the companionway. The traveler is on the cockpit sole and the mainsheet, which includes gross and fine controls, is placed for the helmsman to trim. The primary winches are also within easy reach, allowing the boat to be singlehanded, ideal for a sweet daysail after work. The transomhung rudder provides dinghylike control and it took me a bit of practice to avoid over steering.